A comprehensive understanding of toxicologic pathology is essential for those in industry, academia, and government who make decisions concerning the safety and efficacy of drugs and chemicals. Toxicologic pathology relies heavily on the fields of both toxicology and pathology, which are well covered individually in various texts and references; however, there are few texts that address the field of toxicologic pathology. The Handbook of Toxicologic Pathology fills this void and is thus essential for all health professionals within or interacting with the field of toxicologic pathology. This two-volume set provides the reader with a single reference for toxicologic pathology. 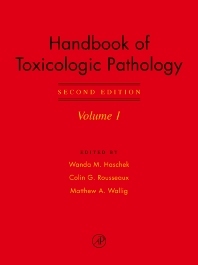 In volume I, the book covers toxicologic pathology in its basic aspects, including its definition, the basic biochemical and morphologic mechanisms underlying the discipline, the basic practice of toxicologic pathology (including special techniques) and issues essential to the understanding of toxicologic pathology such as risk assessment, experimental design, and statistical analysis. Next, the book moves to specific issues affecting the "practice" toxicologic pathology, including issues such as knowledge management, regulatory affairs and writing pathology reports. Finally, Volume I closes with several chapters that deal with specific classes of environmental toxicants such as endocrine disruptors and heavy metals. Volume II addresses the toxicologic pathology in a thoroughly standardized systems manner, addressing the basic structure and function of a particular organ system, its response to toxic injury, mechanisms of injury and methods of evaluation of such injury. Researchers in the area of toxicology and pathology, veterinary scientists, veterinary diagnostic and medical forensic laboratories, and pharmaceutical and chemical companies. Organ-Specific Toxicologic Pathology: An Introduction. Respiratory System. Skin and Oral Mucosa. Gastrointestinal Tract. Liver. Pancreas. Kidney. Lower Urinary Tract. Cardiovascular and Skeletal Muscle Systems. Bones and Joints. Nervous System. The Eye. Immune System. Hematopoietic System. Endocrine System. Male Reproduction. Female Reproduction. Embryo and Fetus. Professor Rousseaux is a Fellow of the Royal College of Pathology, Diplomate of the American Board of Toxicology, Fellow of the Academy of Toxicological Sciences, and Fellow of the International Academy of Toxicologic Pathology. He is Professor (Adjunct) in the Department of Pathology and Laboratory Medicine, Faculty of Medicine, University of Ottawa, Canada. He has 35 years of experience in comparative and toxicologic pathology with a research focus on herbal remedies, fetal development and teratology, and environmental pollutants. He has described, investigated, and evaluated numerous toxicologic pathology issues associated with pharmaceutical, pesticides, and agrochemicals. He has served on the editorial board of Toxicologic Pathology. He is a former president of the Society of Toxicologic Pathology. Professor Wallig is a Diplomate of the American College of Veterinary Pathologists. He is Professor Emeritus in the Department of Pathobiology, College of Veterinary Medicine, the Department of Food Science and Human Nutrition, as well as the Division of Nutritional Sciences at the University of Illinois. His research has focused on the chemoprotective properties and mechanisms of phytochemicals in the diet, in particular those in cruciferous vegetables and soy, and the pathophysiology of pancreatic injury. "The 2 volumes are excellent companions that complement each other as a "1,2" punch! This publication should be on the bookshelf of clinical toxicologists, environmental professionals and laboratory investigators..."
"...gives an excellent overview of the numerous processes associated with toxicologic pathology as used in risk assessment. It stands alone as a classic textbook in toxicology, or would be an excellent supplement to other such books. ...Its readability will allow acceptance to all scientists ranging from undergraduate to experienced industry/regulatory professional." "...very readable, well-referenced, and current... an excellent book for research training."